BRINE, produced as part of Repertory Dance Theatre’s LINK Series, featured choreography by Sara Pickett, Symmer Andrews, Ashley Creek, Sarah Donohue, and Maddi Jones. The LINK Series has recently presented other local artists Graham Brown and My Turkey Sandwich, providing each group with rehearsal and performance space at RDT’s home theater, the Rose Wagner. Sarah Donohue’s “Still Life With Flight” was the standout of the evening. 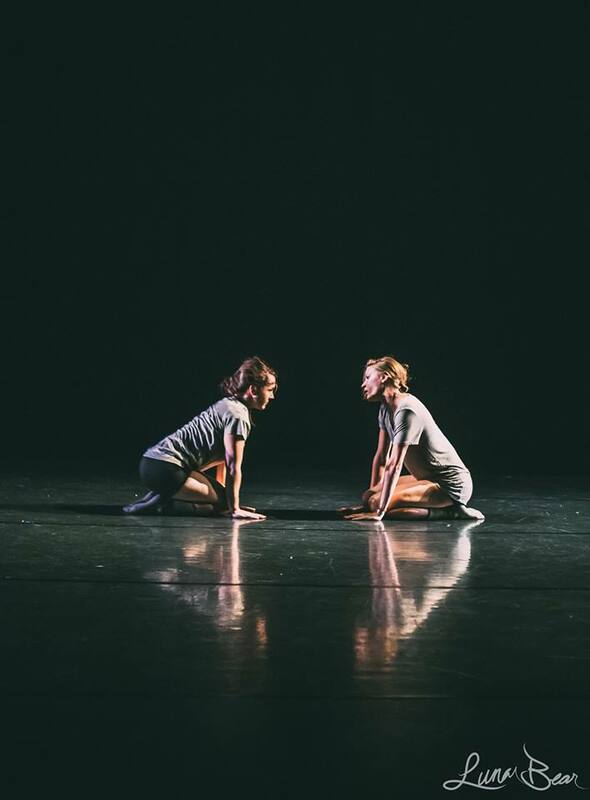 Performed by Lyndi Belnap and Jocelyn Waite, the duet demanded technical precision but also nuance as the dancers moved on and off a long wooden bench. Pivoting between wide fourth positions and off-kilter arabesques while standing, the dancers fidgeted purposefully and gracefully while seated on the bench. The restless gesture sequences unfolded in unison perfectly executed by Belnap and Waite as they crossed their arms, fixed their hair, and rested chins on hands. Their engagement, directed both toward each other and the audience, was captivating and subtly playful throughout. “An-other,” created and performed by Pickett and Jones, also toyed with playfulness, this time in conjunction with hesitation. Beginning and concluding the dance kneeling side by side, Pickett and Jones played with gesture, weight-sharing, and their relationship to each other. Several times, the two women held hands, one arm crossed over the other, like the four cygnets in Swan Lake. Moments such as these and performative facial expressions provided points of interest, but the duet itself ended nearly as it began, with little development occurring despite musical potential. Pickett’s additional works on the program featured larger casts of dancers. In “Solitude, The System,” two soloists existed in opposition to the group framed by dangling lightbulbs. “Play Forward” was set to the upbeat tunes of Mexican acoustic guitar duo Rodrigo y Gabriela and had the dancers doing jazzy drags, chassé-ing in a circle, and even snapping their fingers in a moment of pause. High kicks were punctuated with grins in a large group unison section. Pickett’s entertaining dances differed considerably from two more topical dances by Andrews and Creek. In “Cognizant Regression” the stage was dimly lit save for a strip the dancers inhabited alongside a lone chair (whose purpose was never made clear). Here and there, one would murmur something to the other – “It’s going to be okay” or “I’m not really sure.” The two would then lean in as if to tell a secret or to embrace, but the true nature of their touch in these moments was not revealed. A satisfaction was found in these vague brevities and Andrews and Creek displayed clarity of movement throughout, despite conceptual uncertainties. Andrews’ “Verve” was set to a very brief recording of astrophysicist Neil DeGrasse Tyson, to which the group of dancers executed movements that struggled to relate to the text. Clarity was established as the dancers looked directly toward the audience when Tyson spoke “…the universe is in us,” but the short piece ended before any further relationship between the dancing and text could develop. Creek’s “Apolitical Discourse” also utilized text, in lyrical form by hip hop group Deltron 3030. The opening trio of dancers had strips of fabric tied over their mouth or eyes, the “shhh” gesture appeared regularly as a motif, Deltron 3030 rapped about “crushing corporations” and “global apartheid”, and TSA-style pat-downs were conducted on dancers by those who repeatedly stepped out of a large, moving line. While “Apolitical Discourse” existed on the brink of a statement about freedoms (of speech, of personal space, among others), the specific direction of this statement was lost in the chaos of many ideas. BRINE not only hoped to create one evening of dances by the five choreographers featured, but aims to serve artists in the Salt Lake City area as an ongoing creative collective. With dance as a potentially exclusive profession, the more artists that are able to present and perform, the better. 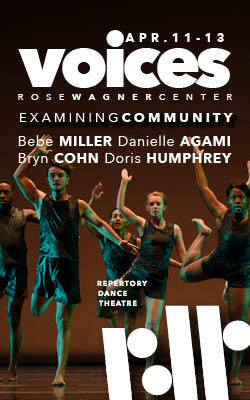 Creator’s Grid and Mudson are among other choreographic platforms that provide local artists with such opportunities. While the inclusion of multiple voices positively serves the community, viewing a full performance of this nature and of this length does present a challenge both for makers and viewers in terms of its vast range of material and topics. When emphasis is placed on the quantity involved, the depth of exploration in each individual work can suffer as a result.